These stunning photos and videos were taken by daredevils addicted to extreme urban climbing who aren’t fazed by eye-watering heights of the world’s tallest buildings and monuments. Most of the climbers scaled the heights without any safety equipment. Lee Thompson, 31, co-founder of a UK travel firm, climbed the iconic Christ the Redeemer in Rio de Janeiro taking head-spinning selfies and posting them on his blog in June this year. “Looking at this selfie still makes my heart race and knees buckle!” he writes. Equipped with two steeplejacks he and his colleague Oliver Harvey made the 25-minute climb filming it with Go Pro cameras. 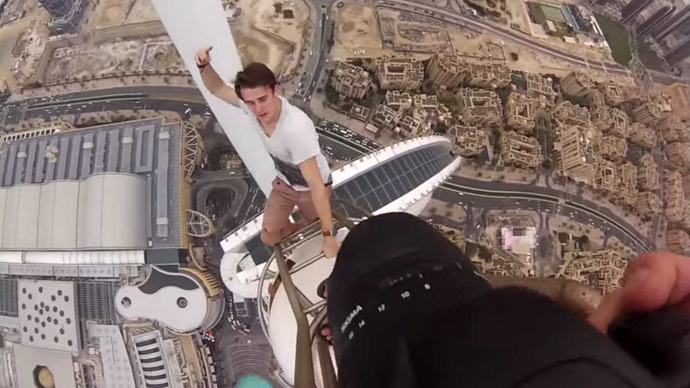 Nineteen-year-old Alexander Remnev, known for scaling a number of Dubai's towering buildings, climbed several city skyscrapers, including the Princess Tower - the world's tallest residential building at 414 m. Along with his friends Remnev took vertigo-inducing snapshots of themselves and the city landscape and posted on his blog in March. “We climbed all the high rise buildings in Dubai without safety equiptment” they said. And of course, there is a heart-stopping video of the process. Another mind-boggling climb, which a team of young men from Russia and Ukraine recently undertook, was in China. 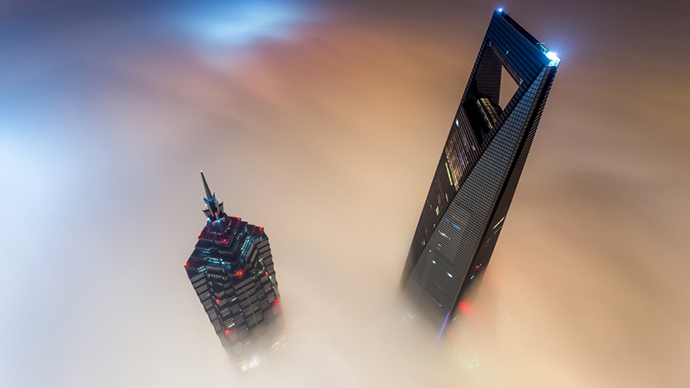 Self-styled ‘skywalkers’ Vadim Makhorov and Vitaly Raskalov climbed the 121 stories of steel girders of the Shanghai Tower, filming the vertiginous ordeal. James Kingston posted breathtaking footage from first person views from a 76-meter Southhampton crane on his webpage in 2013. Not only did he climb the steel constructs, he also performed some jaw-dropping stunts. “I didn't go up there to die. I went up there to live,” he wrote on his YouTube page. In 2012 Russian adrenalin junkie Artyom Pirniyazov hauled his way to the pinnacle of the Kotelnicheskaya Building at 176 meters, completely ignoring any safety equipment . The crowning star of the skyscraper is one of seven similar buildings around Moscow known as 'Stalin’s Seven Sisters'. He filmed his climb in a shocking video called 'Reach for the Star'. Russian girls also have a craze for this extreme urban sport. Student Maria Bezrukova filmed herself in 2012 walking along a narrow concrete beam of one of Moscow’s high-rise apartment blocks, devoid of safety equipment. “When a person overcomes his fear he crosses the line that seemed to be impossible to cross he learns something new about himself,” she told RT. Here's a video of a Ukrainian kid doing pull-ups on a top of a 150 meter construction crane in Kiev. He leaps off the side, on to a crossbar, and does several pull-ups as those watching bite their nails. Mustang Wanted has laid out a vivid display of his daredevil skills throughout the world, in his media library. 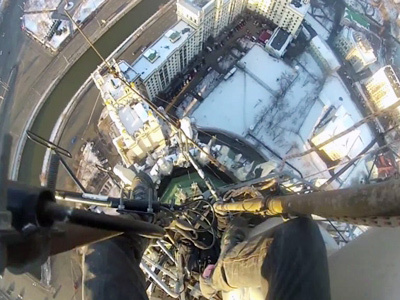 Another study by ‘Raskalov and Co’ in 2012, witnessed five skyscraper-scaling Russians challenge themselves to climb to the highest point of Moscow’s Mercury City Tower without a safety net while it was still under construction. The aim was to touch the end of a rooftop construction crane that hovered at 370 meters above the cold ground. At 339 meters, Mercury City Tower in Moscow recently stole the title of Europe's tallest building from London's Shard. Crane climbing in Norway also seems to be popular with YouTube user Slavik Mus displaying his skills laughing in the face of danger. A global movement of daredevils is growing with YouTube user René Deveaux displaying pride in his video titled 'First Person POV Crane Climb in Austria'. Russian daredevils continue to reach new heights in all parts of the country. 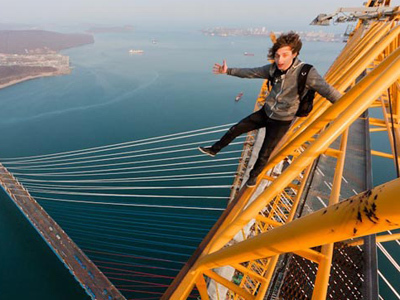 Two years ago, two Russian guys climbed a 350m high bridge crane in Vladivostok. The bridge to the Russky Island is the world's largest cable-stayed bridge, with a 1104-meter-long central span. The views of course are spectacular. A POV crane climb in Los Angeles with James Kingston is yet another video that gained popularity in social media. 13.Can you hear the music 110m above terra firma? Climbing on top of the 110-meter Elbe Philharmonic Hall in Hamburg proved no challenge for one daredevil who used the night as a disguise for his adrenaline-rush challenge. Sam Amstrong, from Winnipeg, Canada, to get a better mobile service reception climbed over 22 minutes to get up to the top of the reception antenna. “Great service up there,” he says. Fly in the Sky YouTube user is asking the public to share his climbing experience of the antenna tower on Blackford Hill, in Edinburgh, Scotland.